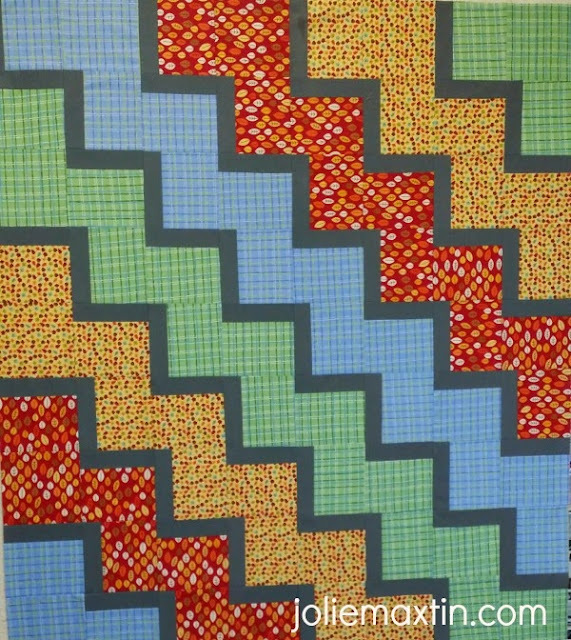 My friend, Jane and I both quilt. Although she prefers traditional quilts (I like modern) and can't stand all over quilting (my #1 preference) we enjoy hearing about what each of us is working on. One of the gals in our book club is having her first baby in or around July, so we decided rather than buying something we would make a quilt. The catch, she doesn't know if they are having a girl or a boy. My job was to order the fabric and make the top and she will baste, and quilt it. Jane: Well how do you bind? Jane: Can you do an invisible binding? Then we both laughed. She really wasn't going to let me bind unless I did an invisible hand binding. It is currently getting quilted, but this is the top. I love this pattern. Finally, I have learned to read past the pattern. I chain pieced with each color and then, cut them apart. The directions have you cutting each piece separately and then sewing, but it takes longer.